From Reykjavik we head south. Our first stop is at the explosion crater called Kerid and then we ride to the waterfall Faxi. We take a gravel road to Gullfoss waterfall for lunch stop. Gullfoss is one of Iceland’s most popular tourist attractions in the country with its glacier water cascade dropping from a 32-meter height into a narrow canyon. On our route to the hot spring area where the world known geyser Geysir is located, we cross a few rivers and ride through the forest at Haukadalur. We will enjoy seeing the active geyser Strokkur that spouts every 10 minutes 15-25 meters. From the Geysir area we ride to Thingvellir National Park. 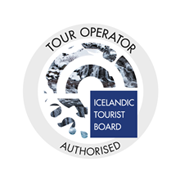 Thingvellir is of great historical, cultural and geographical importance and a must see for every visitor. On our way back to the capital we take the Nesjavellir-route and stop for a great view over the Nesjavellir geothermal power station that services the inhabitants of the Greater Reykjavik area with space heating and hot water needs. 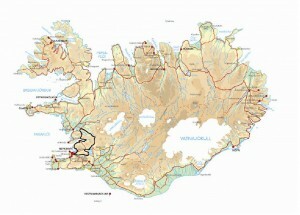 We finish our adventurous day by riding through Hengill volcano’s lava fields and along Hafravatn-lake and arrive back in Reykjavik in the late afternoon. Leaving Reykjavik we head to the Reykjanes peninsula where mid Atlantic ridge rises from the ocean with its volcanic lava fields covering more than half of the peninsula. We ride through the alien lava landscape to lake Djupavatn for a lunch stop. On our ride we will see different shapes and sizes of cones and craters. We take a coffee stop at the fishing village called Grindavik. After Grindavik we ride on tarmac and gravel roads through lava fields until we reach the oldest lighthouse in Iceland. The lighthouse is located near an area of thermal activity, and steam from this source is often seen in photographs of the lighthouse. From there you can see Eldey island, the home of the largest breeding colonies of the magnificent Northern Gannet. You can feel the forces of nature and hear the surf crashing at the beautiful basaltic cliffs. For the next 12 kilometers we will ride on lava roads until we arrive at the well-known Blue Lagoon where we can unwind and relax after a good day’s journey. Heading west we will start the tour by riding around Hvalfjordur (Whale-fjord) with stop at the old Whale-station. This road was a part of the ring road around Iceland until the tunnel under the fjord was built in 1998. Due to the tunnel there is almost no traffic in the fjord itself and it has one of the best tarmac roads in south Iceland with its winding “hilly” turns surrounded by mountains and beautiful scenery. We stop for lunch at Ferstikla service station, café and restaurant where we can discuss how the fjord’s history is linked with the Second World War. Driving to the highland road of Kaldidalur, we will drive around the longest lake in Iceland, lake Skorradalur, We ride through a forest heading up to the highlands. After crossing a part of the highlands we arrive at Thingvellir National Park where the oldest extant parliamentary institution in the world was established in 930. It is also where Europe’s and America’s tectonic plates are moving apart from each other, about 4 centimeters per year. Next we ride around the biggest lake in Iceland, lake Thingvellir, and then we opt for a winding, hilly road that leads us back to Reykjavik.